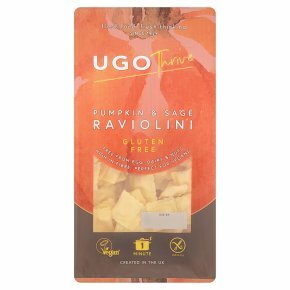 Gluten and Egg Free Pasta Filled with Pumpkin, Non-Dairy Cheese Alternative and Sage. High in fibre. Free from gluten, egg, dairy & nuts. Perfect for vegans and coeliacs. Or for an alternative eat, remove pasta from the pack and place in a microwaveable dish, add your favourite sauce (200g per 125g pasta) and microwave on full powder (800W) for 3 minutes. Bring to a large pan of salted water to the boil. Add the pasta and immediately reduce to a simmer for 1 minute. Remove from the pan using a slotted spoon or drain gently into a colander.